If you have purchased frozen catfish fillets, you might be wondering what you can do with them. You can thaw catfish fillets to fry them, but you don't need to thaw them, unless the fillets were frozen without breading and you would like to bread them. Instead, fry your frozen fillets as is. 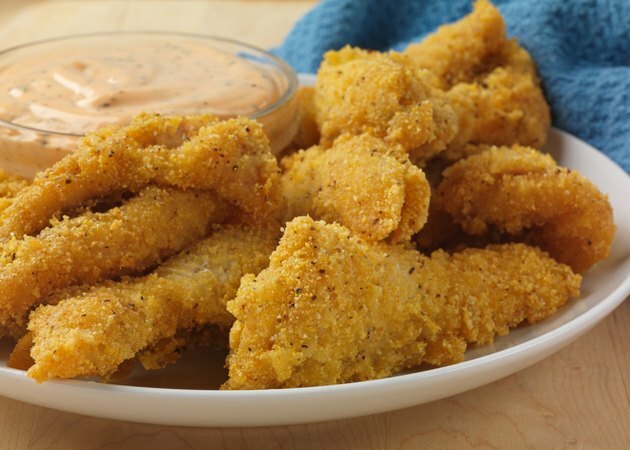 Because catfish fillets are thin and are sold without bones or connective tissue, they will thaw and then cook in the oil in one step. Pour the vegetable oil into the skillet and heat the oil over high heat. The oil should be very hot but not smoking when it is ready. Reduce the heat to medium-high and place the frozen catfish fillets in a layer in the pan, making sure that the fillets do not overlap. If the oil pops violently when you add the first fillet, stand back until the oil finishes popping before you add the second. The oil should stop popping as vigorously after the first two fillets, because the cold fillets cool the oil. Fry the catfish for three minutes, then turn the fillets with the spatula and fry the fillets for an additional three minutes. The fillets are ready when they are flaky and opaque all the way through. If you are frying breaded catfish fillets, the breading should be golden brown. Thicker fillets might need additional time. Remove the catfish fillets with a spatula and place them on a plate covered with paper towels to absorb some of the oil. Season the fillets with salt and pepper to taste and serve them hot. If your frozen fillets are not pre-breaded and you want to bread them before cooking, you will have to thaw them in the refrigerator first. Be careful not to come into contact with the hot oil because it can cause serious burns.